Propylene is the second-largest-volume chemical produced globally. It is an important raw material for the production of organic chemicals such as polypropylene, acrylonitrile, propylene oxide, and oxo alcohols, as well as for a large variety of industrial products. In 2016, about 65% of total propylene produced for chemical uses worldwide went into the manufacture of polypropylene resins. About 8% of the world’s propylene is consumed in the production of propylene oxide, while the third-largest end-use segment, acrylonitrile, accounts for about 6% of total consumption. The remainder went into the manufacture of chemical intermediates such as acrylic acid, cumene, and oxo alcohols. The major propylene markets are Northeast Asia (mainly China), North America (mainly the United States), and Western Europe, which together accounted for about 74% of global consumption in 2016. The United States and especially the Chinese market will exhibit significant growth and account for the majority of the total increase in propylene demand during 2016–21. 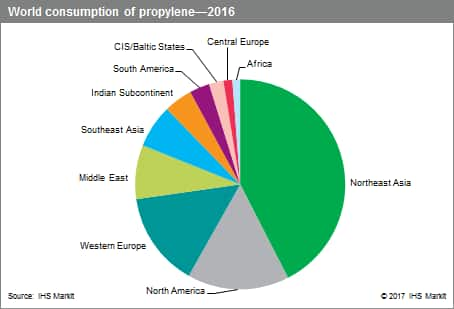 Even though the Western European propylene market is projected to remain almost the same in the forecast period, it will likely remain the third-largest global producer and consumer of propylene. Propylene demand for chemical derivatives is heavily dominated by the production of polypropylene, followed by propylene oxide, acrylonitrile, cumene, and acrylic acid. Ultimately, after further processing into derivatives, then into finished goods, propylene is found primarily in durable goods (cars and furniture), packaging and infrastructure (buildings and houses), and its demand is therefore broadly tied to the general economy. Propylene consumption has as a result been increasingly linked to emerging countries (China more particularly), where the improvement in living standards and growing urbanization are driving increasing use of a broad spectrum of polymers and chemicals. Over the past five years, the propylene demand growth rate has been sustained at about 4% per year, with Northeast Asia accounting for 67% of the new requirements. New propylene capacity is forecast to be developed primarily in the regions where most of the demand growth will take place—Northeast Asia and North America. As ethane cracking will further increase globally, there will be growing requirement for on-purpose propylene production. The share of on-purpose technologies is therefore expected to further increase over the coming five years, accounting for as much as 29% of the global propylene production by 2021. Over the next five years, propylene demand is expected to grow at a pace of about 4% per year, primarily as a result of the further economic development in Asia. In North America, the enhanced availability of propane extracted from shale gas and tight oil and expanded export terminal capability have prompted investments into new propane dehydrogenation units. Globally, massive investments into on-purpose propylene manufacturing plants will result in unconventional technologies accounting for as much as 52% of domestic propylene production by 2021. Polypropylene is forecast to further drive the demand growth for propylene globally, accounting for as much as a 67% share of the propylene market by 2021. The regions expected to exhibit the largest growth in demand will be China, the United States, the Middle East, and the CIS and Baltic States. Of the established consuming regions, Japan and Western Europe are projected to remain stable or see declines as their downstream consumption decreases further.